Strategically positioned midway between Siena and Florence sits a handsome, stone farmhouse villa dating from the 1700's and owned by Gianni and Cristina, a couple who have dedicated their lives to the equestrian arts. The farm estate appeals particularly to visitors with a passion for horseback riding and dressage, for the De Marchis offer everything from basic beginner riding lessons to advanced dressage training, complemented with day long trail rides through the gorgeous surrounding countryside. 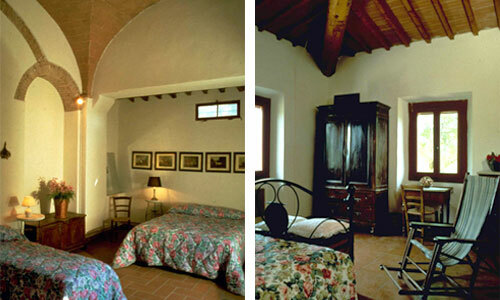 In fact, the center is recognized as one of the top “ranches” in the Tuscany area. Instruction is available for both the rider just starting out in dressage as well as for experienced dressage enthusiasts around the world. With the emphasis on correct basic schoolwork, riders are also encouraged to work on carefully prepared exercises in the lateral movements, transitions, canter and counter-canter as well as work from the ground. For the most advanced level of riders visiting the farm, riders also have the possibility to work on the piaffé, passage and flying changes. But of course there is a lot more. Miles and miles of trail riding in the surrounding typical Tuscan countryside and even a wine tasting stop can be built into your daily program. The riding program offer a wide variety of choices and easily be modified to your riding level and the type of riding you want to improve on. Meals are all taking together at a long rustic table in front of the fireplace - a wonderful place to swap stories of the day with your fellow riders. The chef is an undiscovered gem - you will taste some of the best typical cuisine of Tuscany with wines of the area. A. Beginner Program: 10 riding lessons or 9 lessons and 1 ride out. B. Lessons and Hacking: 6 dressage lessons and 3 trail rides. Additional riding lessons are available from € 32 to 40. Lunches can be ordered a la carte. Pick-up/ drop-off for this trip is possible from San Filippo, Poggibonsi train station, Florence airport/ city centre, or Pisa airport. There are also train connections and bus options. For Jan, Feb and March: the full riding program only upon request with enough participants. Rates do not include: Lunches and Gratuities. Half day rides are approx 3 hrs. 1. Beginner Program: 10 riding lessons or 9 lessons and 1 riding out. 2. Lessons & Hacking: 6 dressage lessons and 3 trail rides. ---- these packages can be customized to your needs ... it is possible to book additional lessons or rides out. Non rider rates include: 7 nights lodging with breakfast and dinner. Thirty well trained horses (Lusitanos, Anglo-arabs, Berber, Arabs, English Thoroughbred and Italian Riding horses) are available. They will be assigned according to the skills and wishes of the riders. The lessons are divided into three groups. Beginners can learn riding from the very first steps. Post-beginners can extend their knowledge and skill or partake in the riding out. Experienced riders can take dressage lessons and combine this with riding out. *Please observe that the beginners program is only for real beginners (absolute beginners or riders that are able to do walk and trot but not canter). Riders that are confident with the three paces walk, trot and canter can reserve the dressage program for the lessons or be aware to pay the price difference if they are unsure and book the beginners program but then become assessed as experienced enough by us. The riding lessons are taken in the training arena adjacent to the house. The lessons are in small groups, which are arranged according to riding skills. The lessons are in English, Italian or French. The lessons for adults last 50 minutes in the morning and 40 minutes in the afternoon. In summer time (from June to September), all lessons last 40 minutes and the two lessons can be run consecutively in the morning if its better for horses and riders because of the hot conditions. The riding out on trails is always accompanied by a local guide. In most cases they follow small country paths or go cross-country. Roads are only seldom crossed. The ride out lasts from two to three hours each – it is calm, with some trot and a little bit of canter if the riders are confident, it is nice for the beauty of the landscape, which is unique in Tuscany and particularly in the Chianti. Children under 14 years of age cannot do the long ride out, but if they are confident, they may do a shorter itinerary of one hour (at the cost of Euro 40). The training method is based on supplying and loosening up the horse to achieve elasticity and lightness in the use of the aids. We follow the very traditional principles of classical riding but which are also practiced by riders competing in modern dressage. The professional foundation is based on the academic style and the qualification is derived from the benefit of several years of training with Portuguese master Pedro Batista De Almeida, a pupil of the great Nuno Olivera. Mr. De Almeida spent his career as the technical director responsible for the Portuguese National Stud which has more than 100 stallions. Non riders: The center also organizes courses in the Italian language and is an excellent base for touring the heart of Tuscany (you should have a rental car). Florence and Siena are just 30 minutes by car. The swimming pool gives splendid views over olive groves and vineyards. This is an ideal place to explore the Tuscan countryside by foot or by bicycle. The beautiful trekking routes of the Chianti-valley can be reached by car very easily. 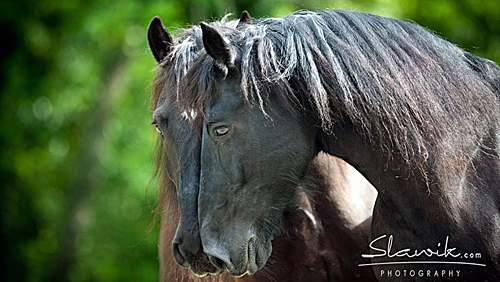 Pace: 2-3 riding hours / day, the trail rides are generally calm: mainly walk and trot, sometimes canter. Hacking out is not available for beginner riders. The quality of tuition is excellent and caters mainly to the novice to good intermediate dressage rider: instructors and guides are BHS, GEA, FISE UISP. Riding lessons are taken in one of the two training arenas and are in English, Italian or French or in German for beginners. There are usually up to 20-24 riders at the center, but the riding groups are kept small to max 4 rider per session -- divided into different level groups. Although these rides out are calm and always accompanied by a qualified guide, they are not suitable for beginners. In most cases we follow small country paths or go across the Tuscan countryside. It is possible to organize riding out with wine tasting or full ride out with picnic. Please note we cannot guarantee hacking/trail riding for children under 14 years old. We can confirm it only once we have seen them riding. To avoid the heat, it’s best to visit in spring and autumn. During the peak summer months of July and August, the weather can be very hot, but it still gets cooler in the evenings. It usually does not rain in the summertime. Autumn brings more comfortable temperatures as well as some rainfall, but there are still dry, sunny days. The winters are not too chilly with the lowest expected temperatures in the peak of winter being around 0°C / 32°F. However, at night, it sometimes gets very cold. Beginners do not have to bring a full riding equipment - we can provide chaps, whips and riding hats (not all sizes). No laundry service is available, but there is one in Tavarnelle (3Km from Il Paretaio). Travelers cheques are accepted. Normal riding gear or comfortable, yet sturdy pants. No leggings please. Riding boots or shoes with flat soles and heels that cover the ankles. We recommend mini chaps. Guests are hosted in an 18th century country villa featuring terra-cotta floors, wooden beamed roofs etc. The house has 8 guest rooms (all with bathrooms) and 2 apartments. On the ground floor is a rustic living room with country antiques, comfy sofas, and piano enhanced by a vaulted brick ceiling and worn terra-cotta floors, off which are two bedrooms. Upstairs, the main gathering area is the dining room, which features a massive fireplace and a seemingly endless wooden table. This room gives access to more bedrooms, each decorated with touches such as dried flowers, white lace curtains, and, of course, equestrian prints. The "special" room in the tower (La Piccionaia) has six windows giving a wonderful panoramic view over the scenic landscape - a must for honeymooners. There are also 2 separate apartments with kitchenette. Meals: Breakfast and dinners are included in this package. Forget a diet here! Four courses are served and a good Chianti wine is always at your disposal (and included in the prices!). The products are genuine and fresh: using olive oil that is produced at the farm. We cater vegetarian food upon request! The cuisine is typical of Tuscany and delicious. The meals are served in the big dining room in front of the open fire place. Four courses are served including as much wine and mineral water as you wish, finished off with an Espresso. This is an international riding center where you will meet at the same long table riders and non riders coming from all over the world. Often 6 different languages are spoken at the same dinner table! You will certainly make new friendship and meet old friends if you are or will be one of our returning friends. *Lunches are not included, but can be ordered daily. Often riders will go into the village, town or all the way into Florence or Siena to sightsee for half a day after or before their lessons. A very dedicated and friendly team will welcome you at the riding center in Tuscany. Carla and Katiuscia will organize anything you need and will be your main contact persons during your holiday in Tuscany. Miriam, Jenny, Stefano, Camilla, Rebecca (the trail guide), Helen and Dany will collaborate with Cristina and Gianni in all the horse riding activities. Rosetta, Gabriella and Bava will serve you fantastic dinners, while Elide will have the direction of the shopping and gardening activities. Ivan is our nice and mad jolly. You will have the chance to meet all these nice people during your stay. Linari: a special light and a beautiful view of the Castle of Linari. Pozzo: a very appreciated room in the hot summer because it is one of the coolest. Maneggio: a cozy single room. The only one with private but separated bathroom. Cavallo: a very spacious room with a special light at the sunset. Piccionaia: a charming and exclusive place on the top of the house with panoramic view on the valley. Volta: a very spacious room and with an independent exit to the garden and a large bathroom with bath. Teatro: a very large and silent room with arched ceiling. Appartamento "Stallina": a very nice apartment with garden and a nice view over the valley. Laundry: We don’t have a laundry service at the facility, but there is a laundromat and laundry service in Barberino val d’Elsa, which is the closest town. It is about 30 minutes walk, but we can offer a ride should you like to visit. (a) 1. EU nationals holding a valid national ID card. (a) Italy is a signatory to the 1995 Schengen Agreement. (b) The regulations stated below also apply to San Marino and the Vatican City.